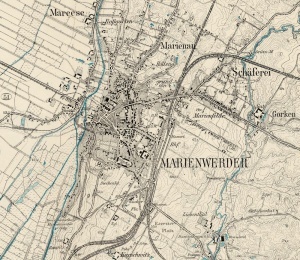 Marienwerder (now Kwidzyn; coordinates: 53.73410 18.91949 [53° 44′ 2″ N, 18° 55′ 10″ E]; population in 1875, 7,580; in 1905, 11,828; in 1939, 19,723; in 2006, 37,814) is located approximately 30 kilometers (19 miles) north-east of Grudziądz (Graudenz), 34 km. (21 miles) south-west of Malbork (Marienburg), and 70 km. (43 miles) south of Gdańsk (Danzig). Marienwerder was founded by the Teutonic Knights in 1233, one year after they founded a fortress castle. In 1466, the Teutonic Knights were defeated in the Thirteen Years' War and their monastic state, including Marienwerder, became a Polish fief. Marienwerder became part of the Duchy of Prussia, a fief of Poland, upon creation of the duchy in 1525. The Duchy of Prussia was inherited by the House of Hohenzollern in 1618 and was elevated to the Kingdom of Prussia in 1701. Marienwerder became the capital of the District of Marienwerder. After the First Partition of Poland in 1772, the Province of West Prussia was founded. Marienwerder was taken out of the Province of East Prussia and integrated into West Prussia, of which it became the administrative seat. Marienwerder was situated in the district (Kreis) of Marienwerder in Regierungsbezirk Marienwerder from 1816 until the end of World War I. The Treaty of Versailles of 1919 transferred most of West Prussia to the Polish Second Republic. The treaty permitted the East Prussian plebiscite in a few areas, including Marienwerder, to determine if these areas would remain in Germany as part of East Prussia or join Poland. 93.73% of the inhabitants of Marienwerder voted on 11 July 1920 for East Prussia, to which the town was joined. Marienwerder came under the control of Nazi Germany during World War II until March 1945, when it was occupied by Soviet forces and returned to Poland. In 2013 it was the capital of Kwidzyn County in the Pomeranian Voivodeship. In 1720 the Mennonites began to appear quietly in the city as naturalized citizens, whereas there had been scattered Mennonites in the Marienwerder Upper Lowland since 1650, and in the Lower Lowland in a closed group, which was later known as the Tragheimerweide congregation, after 1550. In 1935 there were 29 Mennonite families in Marienwerder that were members of the Tragheimerweide Mennonite Church. In 1937 there were 78 Mennonites living in Marienwerder, including 18 unbaptized children. Services were held every fourth week in the Protestant church. In 1945, in the final stages of World War II, most of the Mennonite families were evacuated to West Germany or Denmark. Hege, Christian and Christian Neff. Mennonitisches Lexikon, 4 vols. Frankfurt & Weierhof: Hege; Karlsruhe: Schneider, 1913-1967: v. III, 39. Wikipeida. "Kwidzyn." Web. 13 April 2013. http://en.wikipedia.org/wiki/Kwidzyn. Tgahrt, E. and Richard D. Thiessen. "Marienwerder (Pomeranian Voivodeship, Poland)." Global Anabaptist Mennonite Encyclopedia Online. April 2013. Web. 26 Apr 2019. http://gameo.org/index.php?title=Marienwerder_(Pomeranian_Voivodeship,_Poland)&oldid=145847. Tgahrt, E. and Richard D. Thiessen. (April 2013). Marienwerder (Pomeranian Voivodeship, Poland). Global Anabaptist Mennonite Encyclopedia Online. Retrieved 26 April 2019, from http://gameo.org/index.php?title=Marienwerder_(Pomeranian_Voivodeship,_Poland)&oldid=145847. Adapted by permission of Herald Press, Harrisonburg, Virginia, from Mennonite Encyclopedia, Vol. 3, p. 483. All rights reserved.